I love this book. I am a sucker for animal books that aren’t super sappy and this is a good one. You can read a full review here. 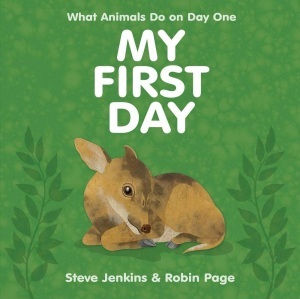 In a nutshell, it captures different animals’ first day on planet earth and how very, very diverse those experiences are. “On my first day, my mother held me close so I wouldn’t drift out to sea,” says a sea otter. A giraffe says, “On my first day, I was born high above the ground – and I landed in a heap. But I wasn’t hurt, and before long I was taking my first steps.” For me, it shows the vast differences between species: different worlds, one planet. I’m hoping that will come ’round to validate for my kid that it’s ok for his experiences to feel unique to him. He likes it too. This entry was posted in children's books and tagged animal stories, books, kids, parenting on November 22, 2013 by skylikeme.